This guide describes how to configure a failover origin server. A failover (backup) server ensures you can maintain availability of your content if your primary server is not available. To configure a failover origin server you must make sure you have health checks configured for your primary server. If you configure your failover server but don't configure health checks on the primary server, the failover won't work properly if your primary server stops responding. Many customers configure load balancing at the same time they configure failover functionality. Our guide on configuring load balancing can show you how. Turn off automatic load balancing on both the primary origin server and the server that will become your failover. Create headers that configure both the primary and failover origin servers. Create a header condition that specifies exactly when to use the failover server. To configure a failover origin server you must turn off automatic load balancing for both the server that will act as your primary origin server and the server that will become your failover origin server. Click the name of the origin server you want to configure. The Edit this host page appears. From the Auto load balance menu, select No. Once you've turned off automatic load balancing, create two new request headers, one each for your primary and failover servers. Click the Create header button to create the first request header. The Create a header window appears. In the Name field, type a descriptive name for the header. This name is displayed in the Fastly web interface. In the Destination field, type the name of the header that will be affected by the selected action. In the Source field, type where the new content for the header comes from. Leave the Ignore if set and Priority controls at their default settings. Click the Create button to create the first header. A new header appears on the Content page. Click the Create header button to create a second request header. The Create a header window appears. Leave the Ignore if set control at the default setting. In the Priority field, type a number at least one higher than the priority you set on the primary server's request header. 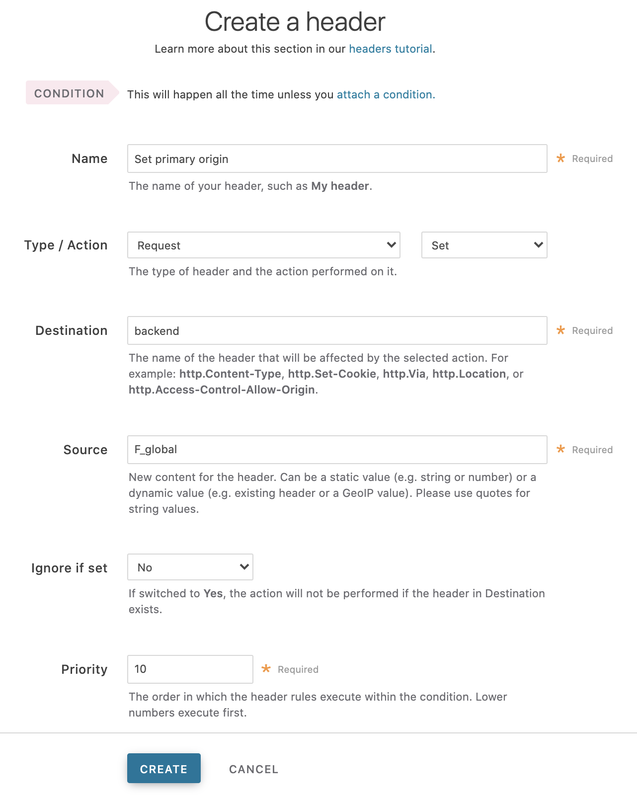 For example, if you left the first header's priority set to the default, 10, you would set the second header's priority to 11 or higher. Click the Create button to create the second header. A new header appears on the Content page. Once you've configured your primary and failover servers, create an associated header condition that specifies exactly when the failover server should be used. On the Content page, click the Attach a condition link next to the new header you just created for the failover origin server. 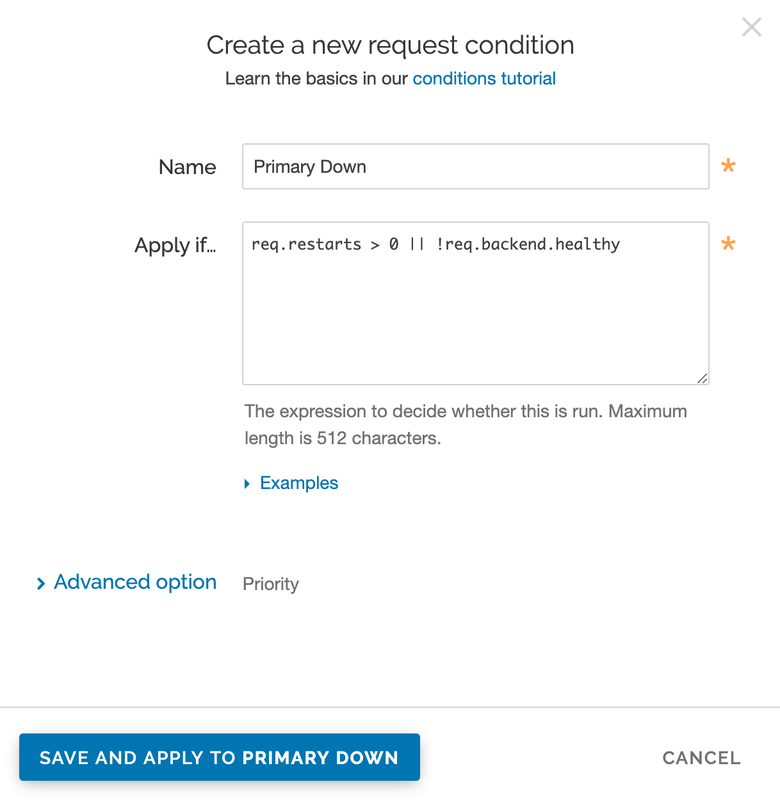 The Create a new request condition window appears. In the Name field, type a descriptive name for the new condition (for example, Primary Down). In the Apply if field, type the appropriate request condition that will be applied. For example, req.restarts > 0 || !req.backend.healthy would tell the system only to use the failover server if the number of restarts is more than 0 or the origin is unhealthy.